To begin with, Parekh's employment contract, which Infosys submitted as an exhibit along with its Form 20F filing with the US Securities and Exchange Commission yesterday, contains a strict non-competition clause. The adage 'once bitten, twice shy' certainly holds true for Infosys, India's second-biggest software services exporter. The strict employment agreement that the company handed over to Salil Parekh, who took over as its managing director and CEO earlier this year, is proof of that. 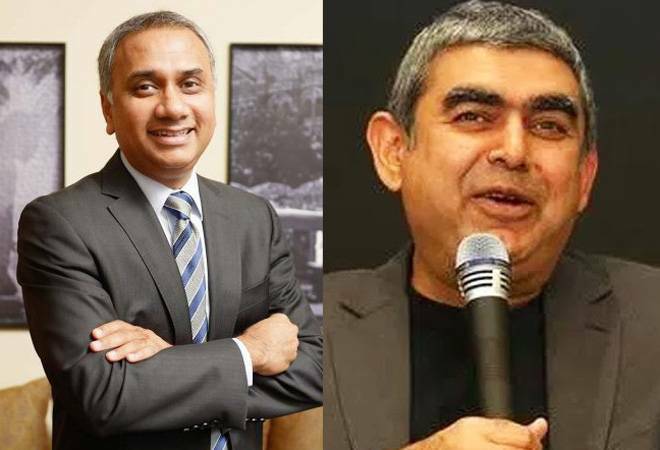 After facing flak over what critics called an overly-generous agreement with former CEO Vishal Sikka - who had left the company after an ugly public spat with its founders led by NR Narayana Murthy - Infosys is playing safe this time round, said a report by The Economic Times. To begin with, Parekh's employment contract, which Infosys submitted as an exhibit along with its Form 20F filing with the US Securities and Exchange Commission yesterday, contains a strict non-competition clause. As per this clause, Parekh cannot neither join a rival company for six months, nor "engage in (including, without limitation, being employed by, working for, or rendering services to) any Competitive Business" in the US, India, and any other countries that Infosys "is doing business in as of the Termination Date" during that time. The agreement also named eight companies, along with their affiliates and subsidiaries as 'Competitive Business" - including TCS, Accenture, Capgemini, Wipro and International Business Machines Corporation -- but specified that the list need "not be limited" to these entities. Furthermore, Parekh's contract is a lot more detailed in terms of what constitutes the cause for termination of the agreement. Where Sikka's contract specified eight such conditions, but Parekh got 14, including "failure or refusal to follow the reasonable and lawful instructions of the Board", if it continues for 10 days after a written notice from the board outlining the flouted instructions. "Executive's engaging in any willful misconduct which is injurious to the financial condition, reputation or goodwill of the Company," was listed as another potential cause for getting fired. Significantly, the agreement specified that all disputes, claims, grievances and controversies have to be exclusively resolved "by confidential final, binding arbitration pursuant to the Mumbai Centre for International Arbitration Rules of arbitration before a panel of three". In other words, the agreement is a waiver of all rights to any civil court action, a condition not imposed on Sikka. Another major change from the previous CEO agreement is the introduction of the "garden leave" clause, which applies to the company's 90-day notice period. Garden leave refers to the practice of asking an employee serving his/her notice period to stay away from the workplace premises - on full pay - or stop assigning work/powers to the employee in question. Parekh's contract also specifies that during the garden leave, Infosys reserves the right to "prevent Executive from contacting or communicating with any current, former or proposed clients, customers, employees, or vendors of the Company". The "Release of Claims" condition, which reportedly ensures that Infosys won't be legally challenged to exceed the promised severance to Parekh in case the contract is terminated, has also drawn eyebrows. "The Release of Claims clause, although pretty common globally, is probably the first time an Indian firm has got it included as part of an employment contract," the head of an executive search firm previously told Mint. Not only did Sikka's contract not include any such clause, but he also reportedly bagged considerably more in severance payment. Parekh stands to get half of his full-year fixed and variable pay, while Infosys had agreed to pay two years' worth of the same to Sikka. With these new conditions, Infosys clearly hopes to avoid prolonged and public legal battles. It is currently trying to settle issues around its former chief financial officer Rajiv Bansal, who challenged the firm's decision to withhold a chunk of his promised severance package. The company had agreed to pay Bansal a severance package of Rs 17.38 crore, or 24 months of salary, but the company suspended payments after he got Rs 5 crore as Murthy and former board member Mohandas Pai objected to the move and termed it 'excessive'. In another exhibit titled "Overview of Executive Leadership Compensation", submitted to the US SEC, Infosys specified that the top management's performance bonus is linked to the achievement of the company and individual goals. "For CEO, the goals mirror the Company targets consisting of revenue growth, operating margin percentage and organization development goals," read the document, adding, "For other Executives, performance bonus is linked to the achievement of Company goals of revenue and operating margin%, along with components of individual goals. These individual goals are linked to the Company's business targets as set by the management and reviewed by the NRC. Adjustments may be made to the payout rate based on the recommendations from the CEO and approved by the NRC." Infosys had posted a pretty lacklustre performance in the last quarter of the previous fiscal, so Parekh certainly has his hands full turning around the company.